IDRBT now invites application for its full-time Ph.D Programme in Computer Science and Information Technology [with focus on Banking Technology] for the session starting in January 2013. Master’s Degree in Computer Applications / Computer Science / Mathematics / Statistics / Electronics / Information Systems / Internet Technology / Geo-Informatics / Bio-Informatics with a minimum of 60% marks in any of the above stated qualifying degrees (a relaxation of 5% marks is provided to SC/ST candidates). All educational qualifications must have been obtained from recognized Universities/Institutions in India or abroad. If grades are awarded instead of marks, candidates should clearly indicate their numerical equivalent. The Entrance Examination for admission to the Ph.D. programme would consist of: i) A Written Examination of 75 marks for 2 hours from 10 am to 12 noon on January 06, 2013 (Sunday) at the University of Hyderabad campus at Gachibowli, Hyderabad, Andhra Pradesh. The candidates must reach the venue by 9.30 a.m. The candidates may note that the venue is around 25 kilometres from the main city of Hyderabad and they should make their travel arrangements accordingly. Candidates arriving after 10 am will not be allowed to take the Written Examination. 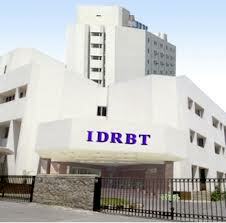 The results of the Written Examination would be announced on the IDRBT website by 9 pm on January 06, 2013 (same day). (ii) Personal Interview (only for the candidates qualifying the written examination) on January 07, 2013 (Monday) for 25 marks from 9:30 am onwards at IDRBT, Castle Hills, Masab Tank, Hyderabad – 57, Andhra Pradesh. The written examination and personal interview would be conducted at Hyderabad, Andhra Pradesh only. Accordingly, candidates called for the selection process should make their own travel and accommodation arrangements in such a way that they can stay in Hyderabad for two days and the Institute shall have no responsibility in this regard. ApplicationCandidates interested to pursue the Ph.D. Programme may apply in the prescribed Application Form which is available in the website. Incomplete applications/not in the prescribed format will be rejected and no correspondence in this regard will be entertained by the Institute. There is no application fee. Candidates belonging to SC/ST category should submit along with the application a scanned copy of the certificate of their caste / tribe from a Revenue Officer not below the rank of Tahsildar / Mandal Revenue Officer. Further, SC/ST candidates belonging to the state of Andhra Pradesh should submit an Integrated Community Certificate issued by the Competent Revenue Authority. Candidates claiming OBC reservation must enclose an attested copy of the OBC (non-creamy layer) certificate issued by a competent authority without which their claim will not be considered in the OBC category.